The last landing of our cruise we had on Westpoint Island. The sun was shining out of a blue sky. The couple that is living on this island, Kicki and Thies, welcomed us with an amazing collection of typical British cookies. I enjoyed the sun with a cup of tea in the flowering garden. After a while a Falkland thrush took over my tea cup and tried to take a “tea bath”. Unbelievable this bird. A Turkey Vulture observed our tea time from a tree next to the garden. But of course I had not only tea and cookies. I used also my time to visit the Black Browed Albatross Colony. The birds were sitting between the Tussock grass. The Albatrosses are breeding together with Rockhopper Penguins. 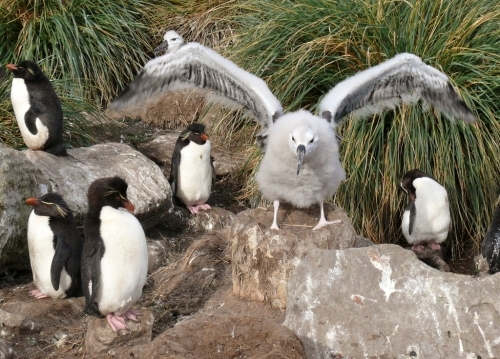 Here you see one of these nice and soft Albatross chicks on the nest, testing the wings.